I was going through a 1971 Family Circle that I bought at a flea market when this ad piqued my interest. 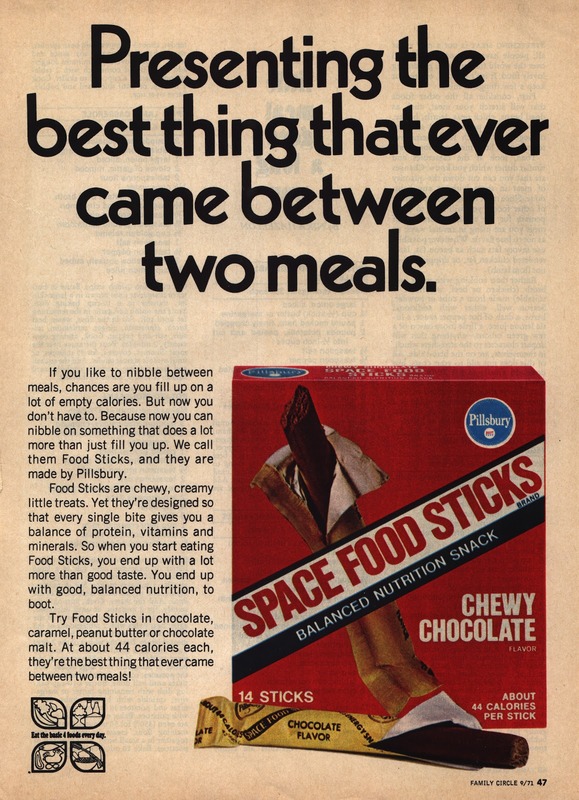 Hmmm...I'd never heard of Space Food Sticks--and honestly, my first impression of the photo is that they didn't look too appetizing. Being touted as only having 44 calories, they were clearly trying to reach the dieting mom demographic here, and promised a dose of protein, vitamins and minerals--a precursor to today's energy bar. To me, they look like a glorified Tootsie Roll. But Space Food Sticks were manufactured by Pillsbury beginning in the 1960s to capitalize on America's fascination with exploring outer space, and they did enjoy some success until they fell victim to deceitful advertising. They were created by the company's chief food technologist Howard Bauman, who--along with his team--developed solid food for astronauts that could be eaten in space, such as "food cubes" (no mention of what they actually consisted of), cake, relish and non-refridgerated meat. Pillsbury wanted people to think that our American astronauts were actually eating these things on missions. They were--in a way--but snacking instead on modified versions, not the commercial version found in stores. 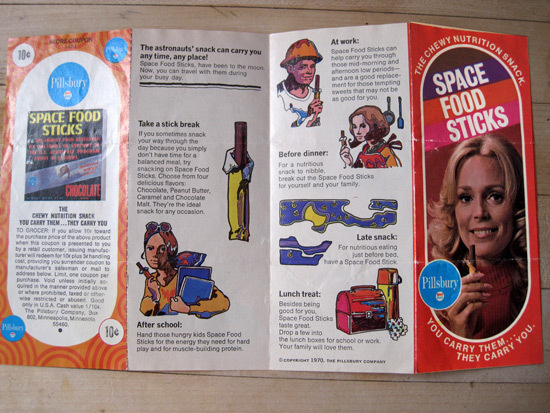 When it was discovered that no Space Food Stick had actually been taken on a space trip, Pillsbury dropped the word "space" from the title and simply called them food sticks. Another unfounded claim that Pillsbury had to nix is that they were as nutritious as milk. Their popularity waned from there and they disappeared from store shelves in the 80s. That is, until just a few years ago when the site Retrofuture.com joined up with a food scientist to recreate Space Food Sticks in their chocolate and peanut butter flavors and sell them at FunkyFoodShop.com. Commenters who grew up with them as kids say the taste and texture is very much like the aforementioned Tootsie Roll. You can learn more about them and other space-related foods at The Space Food Sticks Preservation Society. In the meantime, here's a great vintage commercial for them as well as for a knock-off, Space Energy Sticks. Any Go Retro readers fans of them, or remember them? I remember these. Tang they were not! They were inedible. I grew up in a house with four kids and no snacks and you still could not get us to eat them. They were truly space sticks because all they did was take up space in the pantry. Stay-at-Home-Dad - Gritty and caulk-like? Yummmm! I'll check out the blog link you sent along. Hard to believe that there was once a time when kids were excited about the space program. Mike - "take up space in the pantry"--LOL! I don't remember these, but then again, "food sticks" doesn't sound too appetizing. The only space related food I recall was Tang, which I loved. I actually have a full box from 1968! Wonder how they've held up? I still have a full box of space stocks from 1968! I wonder if they would still taste good?! Kind of salty... like a softer, drier more stable fudge like tootsie roll. - chewed like My mom's old diet supplement (called AYDS)Probably an acronym for something.. not really funny Now of course. Anyway they were chewy and FUN - sort of like the old Tiger's Milk protein bar. if I ate one now days it would taste vile.... but the texture was Groovy. and fresh as the day they were made. My mom tried to tell me I was crazy and there never was a food like this. Even though I remember her buying them. Can't wait to show her.